Club Penguin Cheats by Mimo777 Club Penguin Cheats by Mimo777: Club Penguin Mission News! Herbert Is In The Club Penguin Times! It's true! 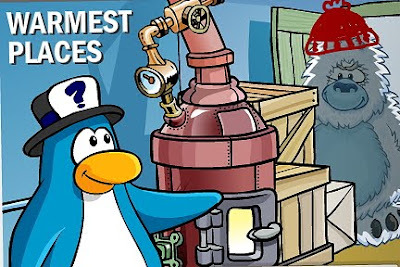 In the "In Focus" section of the Club Penguin times, there is a "taller penguin" in a Yeti costume asking about the warm places on the island. He also mentions several things about past missions. Hmm, penguins don't have feet and paws! It must be Herbert! What do you think he is up to looking for warm places around the island? Thanks to Diffly123 and all you other penguins that confirmed my suspicions about this being Herbert. And, of course, thank you Club Penguin for listening to us once again! I saw, that yeti ''penguin'' is taller and ask about WARMER places.. Warm and Herbert... He always want to be in warm! It says "i mean pause'" after it! its herbert cant you see those evil eyes! now it has to be Herbert because as another penguin said earlier, he is white around his eyes, and is taller than most penguins, he also slipped up when he was talking. I noticed that his eyebrows are white, too. So this has to be Herbert. LOOK AT THE 'YETI'S EYES CLOSELY! I THINK HE WANTS HIS PLAN IS TO USE ALL THE FAIRE AND DO SOMETHING WITH THE PUFFLES! Look close! The same eyebrows, the same evil looks, the same EYES! IT IS HERBERT! Don't Yeti's like cave's and places in snow. And I think it is Herbert because if you look very closely you can see where the lining of the suit is and where the body is underneath and the eyes look very angry just like Herbert, also you can see two hairs from his head. Well Done! I noticed that too. I agree with everything except the hat. I mean wouldn't the penguin notice there is a crab on the "Yeti's" head. You're right the "Yeti" is taller and ever since Herbert has come here he has wanted to be in the warm. I mean that was even the reason why he left the arctic to come here in the first place! yes this lodge is quite well built it would take a very powerful well designed invention to knock it down. so maybe herbert wants to knock down the ski lodge or all the warm places. It's Herbert! A big round of applause for everyone who guessed it right! *claps* Now all we need is the mission. HMMM THATS IT! He dosent want to be warm HE WANTS THE PENGUINS TO BE WARM! but why? Sorry I ment you can see two eyebrows. HEY HEREBERT could be in that yeti costume! you never know! Yeah you can see herberts eyes! I don't think Club Penguin will make the same mission twice I mean that would just be boring because they have all ready done that. We have already done a mission where Herbert tries to knock down the warm places. Mimo - Look at the eyes of the costume and then look at the eyes of herbet. It might be the same. .
on page b2 it says and lot's of hot sause on your vegaterian pizza and herbert eats vegaterian pizzas!!! I think Herbert is the Yeti penguin!! If you look in one of the pics of him you can see white above his eyebrows and no costume is there!! I think its Herbert... Another thing that tells me its him is because it says he likes vegetarian pizza, which he ate in one of the missions. And he says it would take a powerful machine to knock down the ski lodge..he tried using a machine to knock it down but he did NOT succeed!! Its Herbert! Because if you look near his eyes, you can see eyebrows, and no penguin had eyebrows! And also in the tip of the week he says DO A VICTORY DANCE AFTER LIGHTING A FIRE- what he did in a mission. And don't put a bucket of water near the fire of you or your FRIEND MIGHT SPILL IT! herbert rhymes with sherbert! warped! i know, that was random! that is Herbert! you can tell by the `Penguins` eyebrow! hey mimo i think herbert is going to probably warm the puffles up like popcorn!!!! If you go to the spinning arrow room (Mine shack) it will say a joke, Q.What do you get when you cross a polar bear with a penguin. A.Trouble. Herbert the POLAR BEAR is causing TROUBLE for PENGUINS. It might be a sneak peak of herbert on next mission! Can't wait!I have no idead what it could be? Its Herbert! Im sure he's taller thank the penguin and penguins dont have eyebrows!and yeah the pizza! One of the mission Herbert did have pizza!It confirm its Herbert! "Campfires and I dont get along. why don't you take us to the volcano instead? thats WAY hotter than this deepfreeze." Mimo, take a look at the eyebrows. Is that y we have card jitsu fire first? not card jitsu water+snow? I don't think the pan of water and the left speaker has anything to do with the mission because that has been in an april fools party before. I agree with you, I don't think club penguin will make Herbert do the same thing twice. What about Sensei? (jk) I know what you mean really, and I agree with you. The Yeti penguin came out when there was a maze in the ski village, and a Yeti penguin is a penguin with a Yeti suit on. If you look at his eyes, hey have white around them, and gray eyebrows. And he is taller than the penguin. So he has to be Herbert. Wow I didn't notice that. It might be something useful. the person in the yeti costume looks like herbert! just look at the eyebrows and you'll see why. mimo, we need the answers to the what's different quiz. Waddle on! I'm just curious mimo but how long ago did we get our last mission? Its been SO long so i was wondering. Dude i discovered a glitch!!! Throw a snowball in the ski lodge and walk on it. You get transported to the light house!!!! AWESOME! Why is he there? And furthermore if Herbert is looking for warm places what about our green party? Maybe he's trying to ruin our green party by finding warm stuff like fire to burn the leaves and plants!!! PSA agents, we must stop him! hey mimo do u remember how last year there were those boxes that transported you to different rooms? remember the one in the ski lodge that transported u to the lighthouse? well if u walk to the corner below the door u transport to lighthouse even though theres no portal! weird glitch huh? nope its herbert. if you look where the opening of his eyes are his skin is white and there's no color white for penguins, only for polar bears. and you can sorta see his face. :] hope that made sense. and if you notice... there is WHITE "skin" instead of black or colored! It must be herbert! Hey every one, note that the 'Tall' yeti penguin said things that inclued herberts schime because he said "This lodge is quite well build... It would take a very powerful, well designed invention to knock this down, I would say" and he also said in the boiler room "Hmm... That wall looks like it was drilled by a GENIUS awhile ago... Dont you think? MIMO, ON THE PAGE IN THE NEWSPAPER WHERE OT SAYS SENSEI'S UPCOMING EVENTS, ON THE TOP RIGHT IT SAYS LOOK FOR NEW CARD JITSU SIGNS!! FYI:I was not yelling I was talking fastly and it sounded like I was yelling. You can also see that the person in the Yeti costume is white. Notice it says about making a campfire from the ski lodge? That was Herberts first plan!DEFINATLY HERBERT!!!!! hey mimo theres another clue for the next mission, look in the boiler room theres a kind of fry pan with hot water !!! I think it's just that the YETI COSTUME has PAWS. Penguin was in said COSTUME. And also, it's a YETI not a POLAR BEAR. Duh. Yeah it is weird! Well done for finding it. We think that it is Herbert in the Yeti costume giving a hint about the new mission. •If you take a close look at his eyes you can see some more white fluff around the thingy. My brother says thingy weird. Hey mimo plz can you have a post on keeping their password safe cause I got hacked and my coins are gone!! this might not be new but im confused! i am a non member. and i tried adopting a blue puffle and it says anyone can get it but it says i need to be a member! fantastic theory. i think ur right. but remember mimo in your other post: 6 month til this mission. 6 months later: herbert got away. Might be... I think it has to do with the new mission. remmember on mission #9 (spy and seek) when you look through the binoculars you see herbert trying to make a fire and when he sucseeds klutzy and him have a victory dance but klutzy accadentaly knocks over the water bucket. warm food is much better than cold food. add plenty of hot sauce to your vegatarian pizza, and it will keep you warm and happy for hours. it took more than 75 logs to make the ski lodge. thats enough wood for a campfire to last almost a year! "yes, this lodge is quiet well built, it would take a powerfull, well desighned invention to knock it down i would say." on mission #6 he wants to knock down the ski lodge! also you can see his WHITE fur and gray eybrows. i defenaitly agree with you! probably when he says feet and paws, he means it in a yeti's perspective. it is herbert because you can see the colour of the penguin in the yeti suit around their eyes and they are white so it must be herbert!!! Yeti's LIKE the cold. And so do penguins! So why would a Yetti OR a penguin ask about the warmest places? EMERGENCY POST MIMO! I found out it is herbert! heres proof: See the second photo (not the first cause its not clear) and see very little upper toward his eyes and you see white! That is ULTIMATE PROOF!! That isnt a Yeti* Penguin! I hope you got it. It changes the sky, how cool? Wow that is weird! I think it is just a glitch so try again later sometime but if that doesn't work contact club penguin support. The eyebrows..... What is he up to now? It probaly is, but I don't think so. You might be right! But I still think it is Herbert. Nice idea though! 1: Tip of the week - in mission 9 Klutzy knocked bucket of water on campfire. 2: Check it out - in mission 6 Herbert wanted a VEGETARIAN pizza. 3: Of course we can see his Eyes! 4: How it's done - Well, you know. Wow! That's a lot of clues! Well Done! Mimo! I just discovered it is definately Herbert! read the article and it says the boiler room wall must have been drilled through by a genious, in a mission Herbert drilled tunnels through town and got to the boiler! In another mission Herbert tried to knock down the ski lodge and he said it must take a very powerful invention to knock it down and Herbert made one for that mission. Also ever since Herbert came to Club Penguin he has been obsessed with being warm. Also you can see the wrinkles of Herbert's face just a tiny bit higher than the yeti nose. You can see his grey eyebrows his angry non-penguin like eyes and finally you can see his white fur under the suit. Gasps and wheezes while getting my breath back. CP actually did sell a yeti costume a while back. Not sure which party though. I found different signs of the iceberg tipping. Here they are! 2)The spinning arrow room saying,"does the iceberg seem tippier than normal?" 3)Sign at iceberg during April Fools says WHO CAN TIP ME!? 4)The Newspaper(page C6)it says on his To Do List, watch for signs of new card jitsu paths. What surrounds the iceberg? WATER! What is the next element? WATER! It all makes sense! he mentions the volcano. so i got 2 theory both you will not like. 1:he gonna BLOW UP club penguin with the volcano!!! 2:BURN EVERY SINGLE PUFFLE TO DEATH IN THE VOLCANO!!! I think it was herbet cause his eyes were the same and you can see the white behind his yeti costume (btw I think the yeti costume was in the snow maze as a prize.) As you said the paper did mention feet and PAWS but he was also in a warm place and normal yetis dont dont like warm places, i think... anyway that means he cant be a real yeti and he was taller then the penguins. The guy in the yeti costume is herbert! Deffo not a penguin, bacause under the costume , with face is white - you can't have a white penguin! HERBERT IS TRYING TO STEAL ALL THE WARMNESS! AAAAAH! I knew it was herbert when i saw the eye's and that it was a taller "penguin". I think it's Herbert AND i think he's talking about warm places to stop the other penguins being suspicious because polar bears like COLD places. Remember the Great Snow Maze? When you finish it, you get a Yeti costume! It's herbert for sure because I can tell by it's eyes/eyebrows, and...Penguins can't be white! I don't really think it is. I mean, if you think about it, why would CP joke about that? I think it's letting us know that the mission is right around the corner. It's obviously Herbert, that's already clear. No penguin can be white, plus I would know those eyes anywhere. look at the eyes. The are white around the edges. Penguins have different colours (depending on the colour) and the 'yeti penguin' has eyebrows!!! It IS Herbert! Look closely at the yeti's eye holes. look at his eye it is herbert! Yep,your right...or are you! jk Your right! So Herbert must be up to something we PSA Agents better stop him!